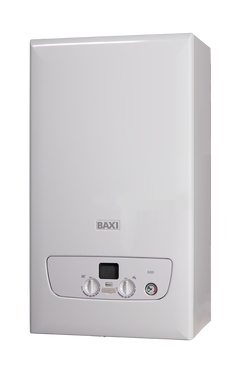 The Baxi 624 Combi Gas Boiler is a condensing wall mounted boiler which includes a variety of features and benefits. This boiler has been designed as a compact unit which is able to fit in a standard kitchen cupboard to save you space and keep it out of sight. The low lift weight of only 29.5kg makes it perfectly suited for a quick and easy installation which should also save you money. This unit is a high efficiency boiler with an A rating of 89% efficiency. With an 24kW output rating it is perfectly suited for small and medium sized homes with one bathroom and not such a high demand for heating or hot water. A 30kW model is also available. The pipes are within the boiler casing keeping all the mess out of sight and it has an easy-fill permanent filling link making it easier for the system to be topped up. Other key features include a brass hydraulics block, an openTHERM interface, compatibility with uSense smart controls and a simple hanging bracket. This unit also features a choice of flue lengths. As a Combi boiler it supplies hot water and heating on demand by using the mains water supply. This means you don't need to have bulky tanks or cylinders making them perfect for smaller homes where space maybe limited. With this highly reliable unit you receive a 5 year warranty to give you peace of mind that this unit is not going to let you down. 24kw,30kw,36kw cupboard fit combi, rear piping as standard, stainless steel heat ex, brass hydro blocks, easy fill loop all with a 7 year warranty, what’s not to love!!!!!! !